This past Saturday at the Alamodome, in San Antonio, TX, super-welterweight prospect, Daniel “The Beast” Baiz (10-1, 5 KOs), scored a victory against Yunier Calzada (6-2-1, 1 KO), in a hard fought 4-round slugfest. 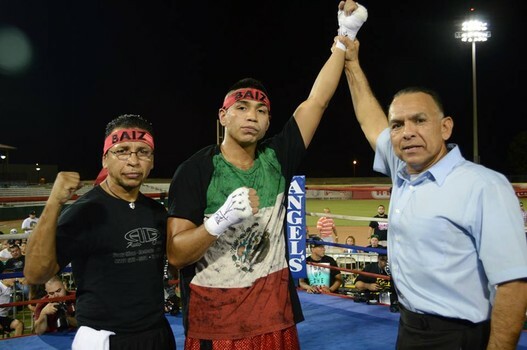 Managed by Prince Ranch Boxing’s Greg Hannley, Baiz showed his hometown fans why he is must watch boxing. Toe-to-toe action commenced from the opening bell as both Biaz and his opponent Calzada, went right at each other. Biaz, a southpaw, was throwing hard punches, landing his signature straight left throughout the entire fight, in addition to his powerful right hooks. Calzada, stood his ground, but was getting beat to the punch. Calzada had his moments, but was outworked by Biaz, who was determined to come out victorious in front of his hometown fans. The fight was fought in a phone-booth for four rounds and the fans were thrilled to see these two warriors go at it. At the end, Biaz came out on top as the score cards read 39-37 twice, and 40-36, all in favor of Daniel.